Building block sets are important for every toddler to have. It helps spark imagination, teaches hand and eye coordination and teaches toddlers to find solutions. But you want to make sure that you get a safe set. One of the best sets that you can buy is the Mega Bloks First Builders Big Building Bag. This is a big 80-piece set of colorful blocks made of hard plastic. These blocks are perfect for small hands. The bloks are 2 to 5 inches wide, easy to handle, hard to lose and too big to swallow. The 80 piece mega bloks are made in Canada also come in a reusable bag. There’s no doubt that little boys love to be in motion.The best toys for little toddler boys are ones that help him to stay active. You can get the Little Tikes First Slide for your boy. This toy can be used as an indoor or as an outdoor toy. The ladder has a wide base that helps keep it steady – and the steps are wider to help little feet maintain balance. The height is 27 1/2 inches from the ground to the top of the blue handle. When you need to put it away, it can easily fold down for storage. 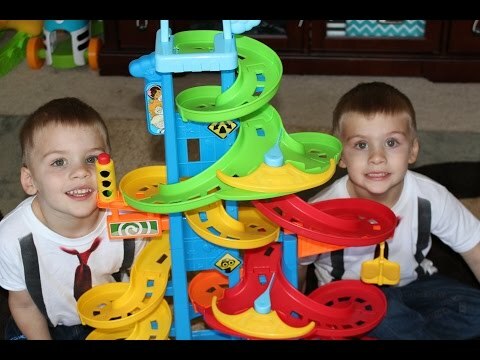 It doesn’t take any tools to take the slide apart – and the safety handrails on the toy just snap together. This toy can help your toddler with coordination as well as fitness. here on A m a z o n! With the VTech KidiBeats Drum Set he can enjoy drumming in tune with the included melodies that are done in different genres. There are nine different melodies and each of the melodies is pop, rock or dance. But if he doesn’t want to play the music that’s already included, he can play on the drums and make up his own melodies. The toy will also help your toddler learn his numbers and letters as he plays. The VTech Kidibeats learning drum set is a fun and educational toy for a toddler. The toy features three drum pads along with a cymbal that a toddler can use to make music. Playing sports can be a lot of fun for toddlers and little boys love to play basketball. You can get the Little Tikes EasyScore Basketball Set and help him learn how to play the game. Playing physical games like basketball help toddlers improve their coordination as well as grow their motor skills. This hoop is safe for kids as young as 18 months to use. The Little Tikes Easy Score Basketball Hoop Set can change height as your child grows. You’ll want to fill the base of the hoop with sand to help keep it steady. A small, toddler sized basketball is included with the hoop. on A m a z o n! You want toys that allow your child to play pretend and enter another world in their minds. One of the toys that aids in this type of play is the Fisher-Price Little People City Skyway. This City Skyway Fisher Price is an easy access toy that’s about the height of a small child. At three feet in height, this toy offers a twist and turn tower of fun. The toy can easily work with kids’ toy cars. Cars can zip and speed out through the exits including the jump exit. The set comes with a traffic signal, a crane and a gas pump. The gate is a working gate and there’s even a parking meter for parked cars. Two cars are included, the set comes with a Koby and a Tessa car. The Little People Wheelies City Skyway on A m a z o n! I hope you found this list of great toys for two year old boys helpful in your quest for the perfect gift! P.S. Please follow me to my next post where it´s all about toys for two year old girls.